I'm Vera Campbell, and this is my online sewing portfolio. I am a 22 year old college student attending the International Academy of Design and Technology (IADT) I am in the fashion design program, but I am hoping to get into movie/theater costume design. I got my first sewing lesson when I was 10 from my mother (a quilter) at a slumber party in which she taught my friend and I how to sew a baby blanket and pillow. I don't remember sewing much since then, I remember collecting fabrics and doing little handcrafts. Then one day in middle school I decided I wanted to make a quilt. I cut plain squares out of the random fabrics I collected and made a basic 9 patch quilt with a large square in the center which I painted my young cousin, Jenni,'s name, which I gave her for Christmas. Next, I decided to make a quilt for my cousin Kelli. I jumped right into a cardtrick pattern. I was in highschool sewing class then, and I finished my projects so quick that I had time to finish this quilt in class. During senior year some friends decided I *had* to go to coronation dance at school because it was my senior year and they had never seen me wear a dress. I picked up the pattern, decided I didn't like it, and altered it without instruction. 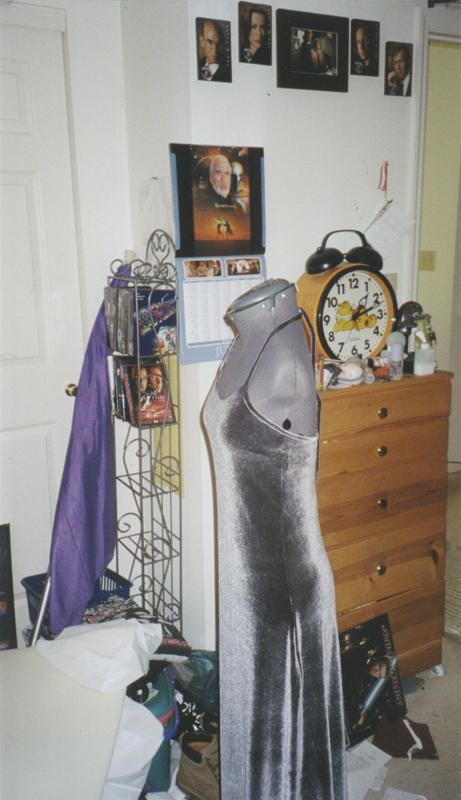 That year, I made a log cabin quilt for my grandmother, a Jedi costume for a Safe Halloween night for kids I volunteered at, many failed costume experimentations, and my first gown I designed from scratch: [SILVER VELVET DRESS]. At that point I was addicted to sewing, but as I was no where near professional I thought of this as just a hobby and not a possible career choice. Since I taught myself HTML and some graphics works since about 2000, I decided to keep going with the computer field and joined ITT Technical Institute. I basically bought my degree. It is a horrible school and even though I have an associates degree in Software Applications Programming, I can't code worth crap. About halfway through that school I was doubting whether I was on the right path. I started my bachelors degree at DeVry for computer security systems, but thanks to some slapping upside the head by many friends, and given an ultimadum to choose by my parents, I decided computers weren't right for me and sewing can be a real career choice. Since then I have gotten plenty of practice. I am now a member of the Society for Creative Anacronism (SCA, corrupted into by my best friend Zizzy) and have made quite a bit of renaissance garb. I also enjoy movie costume replicas, from Sci-Fi and Fantasy, though I have been known to make a design inspired by the movies instead of a replica. This site was created to showcase my replicas, original and inspired designs, show my research and tips on replica gowns and historical research on renaissance gowns, and perhaps in the future, a sewing resource center.